Aw yeah I did a figure painting! Big thanks to Chuck for making me a list of great digital painting links. Watching a bunch of Daarken’s stuff really got me started in the right direction, and there’s so much more I can’t wait to check out, so thank you! For this figure study I decided to go for a loose, paint-y approach which I never would have pulled off on a real canvas because of all the mistakes I wouldn’t have been able to erase. I think next time I’ll try and get the background working a little more, with a bit more color variation. Right now it looks just a little too um… digital for my tastes, I guess. It’s close though. I just need more practice. On to the next thing! 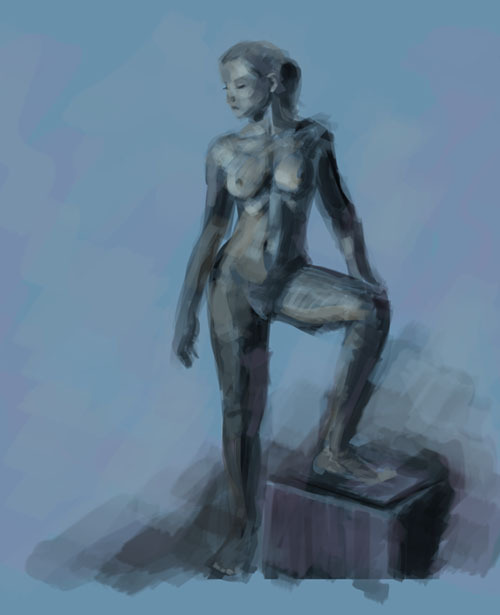 This entry was posted in Digital Art, Figure Study. Bookmark the permalink. So fab! I love the painterly approach, those big chunky highlights on her face & chest are ♥. I cracked up at the tablet rhapsodizing in the post before this, sounds just like me haha. One thing I need to improve my Photoshop painting workflow is a better color picker palette thing. Corel Painter has a nice system for this but Photoshop you have to find good color swatch sets, haven’t discovered one I like. If you see a good one, pass it along! Hey they replaced my emoticons with smiley-faces dag-nabbit.